In June 2000, after two years of fighting in a border dispute, Ethiopia and Eritrea signed a cessation of hostilities agreement following proximity talks led by Algeria and the Organization of African Unity. In July, the Security Council set up UNMEE to maintain liaison with the parties and establish a mechanism for verifying the ceasefire. In September 2000, the Council authorized UNMEE to monitor the cessation of hostilities and to help ensure the observance of security commitments. On 30 July 2008, the Security Council terminated the mandate of UNMEE with effect from the following day. 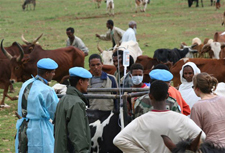 The Council decision came in response to crippling restrictions imposed by Eritrea on UNMEE, as well as the cutting off of fuel supplies – making it impossible for the operation to continue carrying out its mandated tasks, and putting at risk the safety and security of UN personnel. UNMEE veterinary day in Zela Ambessa, northern Ethiopia. 8 September 2007.
in cooperation with the Department of Peacekeeping Operations.